Over the years, I have encountered quite a few early modern recipes based on or consisting entirely of a drink still commonly used today, such as medicated wines and tea. In 2013, I heard James B. Sumner speak at ICHSTM Manchester about his excellent book, Brewing Science, Technology and Print, 1700–1880, on how beer brewing rapidly developed from an oral culture derived from home-based skills, into an industry with an extensive trade literature, based increasingly on the authority of chemical experiment in eighteenth- and nineteenth-century Britain and Ireland. My curiosity was sparked, especially as beer was often seen as a safe alternative for contaminated drinking water, and I asked Dr. Sumner on Twitter whether he had encountered any recipes for beer as a medicinal drink, to which he replied he had not. Cheers! Photo © theNerdPatrol, licensed Creative Commons Attribution. Another option was to add the herbs during the brewing process, either when boiling the malt, or just slightly heating them in the beer after the boiling has taken place. 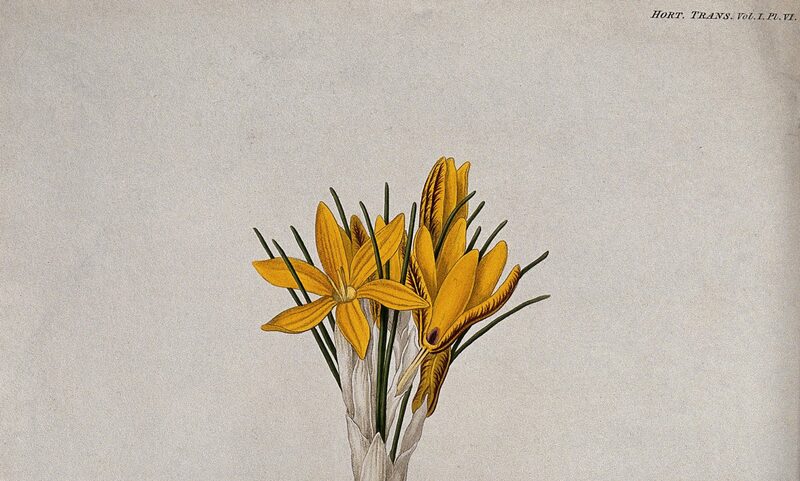 Van Lis mentioned over fifty kinds of herbs to prepare medicinal beer, ranging from ginger, lavender, cardamom, hyssop, cinnamon, aniseed, rosemary, nutmeg, gentian, juniper and lemon grass to plants such as absinth leaves, sweet flag, germander sage, and eye worth. He does not advise which kind of herb-infused beer should be used for particular ailments; this was after all supposed to be at the discretion of physicians. However, Van Lis does advice that ‘Joopen beer’ (which he says literally means ‘juicy beer’ in old Dutch) heats, moistens, and nourishes the body, but causes infected blood, bad digestion, sore eyes, fevers, and gout when drunken in excess. It might seem strange that I have only found one reference to medicinal beer so far, but it makes much more sense when we look at Van Lis’s career. Before he gained his medical doctorate in 1745, he already ran an apothecary shop in Rotterdam, and also owned… a beer brewery. Apparently it ran in the family: his mother ran a beer trading company, and in the year Van Lis graduated, he also published a treatise on beer brewing, dedicated to his promotor, the Utrecht professor Oosterdijk Schacht. 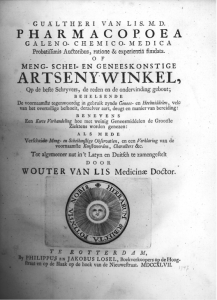 However, beer consumption was decreasing steadily in the eighteenth century, and in 1748 Van Lis sold all his property in Rotterdam, including his brewery with a loss, and moved to Bergen op Zoom to make a career as city physician and apothecary and doctor of the diaconate. As far as I can tell medicinal beer never really took off – although I do remember older female family members telling me that a glass of dark beer should be given to women after giving birth to stimulate the flow of breast milk. 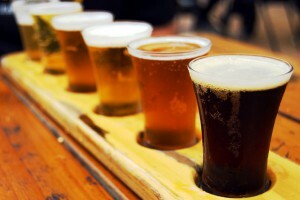 Please do let me know if you have encountered other examples of medicinal beer! There is still a Dutch brewer called Jopenbier, which advertises with ‘recipe 1407’. Although they use a recipe from 1407, as their own website states, this beer was called Koyt back then; the current name has been given to the beer in 1994 and refers to the 112 litre tuns in which beer used to be transported, which were called ‘jopen’. 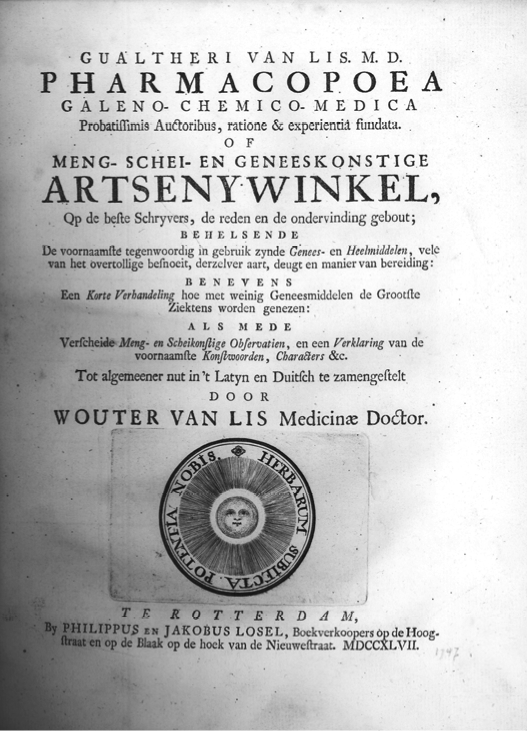 Peeters, F.A.H., ‘Wouter van Lis: Apotheker, Bierbrouwer En Stadsmedicus’, Kring Voor de Geschiedenis van de Pharmacie in de Benelux. Bulletin, 73 (1988), pp 1 – 21. Very interesting! I knew that beer was often flavoured with many different herbs, not just hops, but hadn’t thought about whether there were any medicinal purposes behind that. Would make sense, given the standard development of herb + alcohol as a medicine–the origin of so many liqueurs. And yes, “Guinness for nursing mothers” was a well-known slogan; I’ve heard of mothers being given it in hospital in Britain as late as the 1950’s. Thanks for this really interesting post. I’m in the early stages of some work on alcohol as medicine in British colonial India of the c. 19th to mid-20th, and beer is a big part of treatment and prevention in that context, so it was good to get an idea of earlier beer-based remedies that British doctors working in India (having trained in Europe) may potentially have been aware of too. A little research about hops will tell you that the very reason (at least one of the reasons) they are used in beers, ales, and the like is (or could be called) medicinal. Hops are related to cannabis plants, and are very relaxing and have other qualities. I can’t recite the full list off the top of my head, but hops have quite a few effects. This is one reason the effects of beer are so much different than more pure alcohols like gin or vodka, for example. While I really love beer, there are a lot of 17th and 18th “medicinal treatments” and “folk treatments” that aren’t practiced today for a reason. Really informative post, though, I really enjoyed reading it. I think some people may take it out of context, but everyone is entitled to believe what they will. Apparently (I was told by a radiologist) drinking beer after a barium enema helps the body expel the barium mixture more efficiently. Or maybe the patient just doesn’t mind as much?! Purl was an ale made from wormwood (or a wormwood, I have seen Artemisia maritima also mentioned) that was very popular as a stimulating drink taken in the mornings in Tudor times and after in England. Mentioned by Shakespeare and drunk by Pepys. The equivalent made from wine was called purl royal. I do not know how much was made of its medicinal benefits. Samuel Johnson had it as “A kind of medicated malt liquor, in which wormwood and aromaticks are infused.” By the nineteenth century the recipe had changed to a sort of mulled spiced gin/beer concoction. I’m not sure how far back the authors’ research is intended to be or in what geographic regions, but there are two very notable examples of alcohol being used medicinally in the ancient world in which modern science has found that there were actually strong medicinal qualities to the practice. Only one of them actually involves beer, but I think that it’s helpful to share both. The first comes from the ancient Roman city of Herculaneum, a sister city in Italy to Pompeii. While many know the story of Pompeii’s destruction by Mt. Vesuvius, few know that just before the time of the eruption, a plague of unknown etiology was rampant in Pompeii. When archaeologists examined the bodies at Pompeii and found evidence of this plague, they were surprised to find that no evidence of it was found in nearby Herculaneum, which should seemingly be impossible. They were able to trace the source of the mystery, through the bones of the bodies, to the vineyards being grown in Herculaneum and a certain infestation of the wine crop. The other occurrence was in ancient Nubia, in which archaeologists there discovered the same type of phenomena happening by again examining the bones of Nubian skeletal remains, this time traced to the wheat crops of the ancient Nubians and the beer brewing methods employed by them. The same type of infestation that occurred at Herculaneum with grapes and wine also occurred in ancient Nubia with wheat and beer. The source of this mystery infestation? Streptomyces, a soil-dwelling bacterium. The research teams were able to ultimately determine that, in each scenario, both cultures had learned how to identify this phenomena, effectively plant fermentable crops in a way that took advantage of this phenomena, and develop brewing techniques that greatly enhanced the effect of this phenomena. Essentially, the research teams concluded, these two cultures were taking high-dose tetracycline, an antibiotic class first created from isolates of the streptomyces bacterium. Another element of medicinal beer that I should mention is gruit, an herbal concoction infused into beer for flavoring before the use of hops became common in the Late Middle Ages. It was primarily used in northern Europe I believe.